With English Summer rearing its indecisive head, and soggy sausages mix with sunburns, you can rely on First World Records to bring you a warm and relaxing soundtrack, whatever the weather. We're back with another heavy track for those of you who like things on a laid back jazz tip. 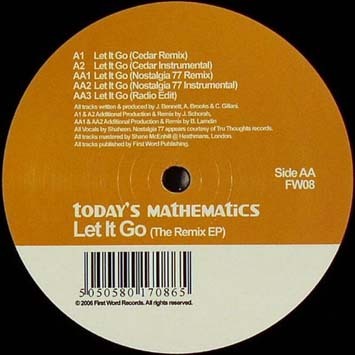 "Let it go", the second single from Leeds outfit Today's Mathematics, comes fully laden with remixes from Tru-Thoughts/Ubiquity's Nostalgia 77 and First Word Records' own broken beat genius, Cedar. Ben has completed remixes for the Quantic Soul Orchestra, Natural Self and DJ Format. Here he has re-recorded the original vocal and produced a melancholic, haunting march reminiscent of Portishead. 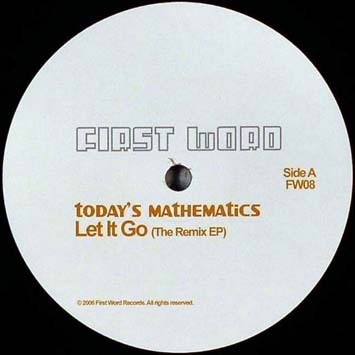 Cedar, the musical masterminds behind Today's Mathematics' live jazz/funk sound, translates the laid back vibe of the original into an itchy foot twitcher that'll get the floor shuffling. (Think Bugz In The Attic meets Sa-Ra). With roots in Drum&Bass, including productions on LTJ Bukem's Good Looking Records, Cedar's love of jazzy broken beats has seen him develop into an outstanding producer of the sound championed by the likes of Gilles Peterson. With a forthcoming single on First Word Records, expect to hear much more from Cedar.